Transformational grammars and unification grammars are trying to solve the same problems. Transformational grammars have phrase structure rules, (maybe something like feature structure sharing), and movement operations. Unification grammars just have phrase structure rules and feature structure sharing (or unification). That’s the good news for unification grammars. The basic explanations are very simple. Unification grammars are able to do this by having very complex information in the lexicon — in individual words. That’s the bad news. The information encoded in words can look very complicated indeed! Let’s look at a simple verb such as walks again. 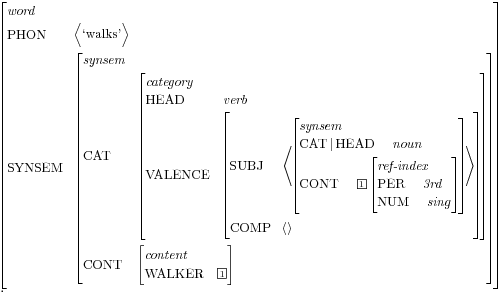 Unification grammars (UGs), like Head-Driven Phrase Structure Grammar (HPSG), start from the idea that you have to provide a serious model of individual words. To do this, they use attribute-value matrices (AVM) in order to model the information that might be contained in words. This just means that we imagine words have attributes — information stored in the words. And this information has some kind of value. In other words, it is organised in some way. UGs tend to have very highly organised information — that’s why it looks scary. We can also refer to these matrices as feature structures. If you feel scared of AVMs, just laugh at them. You’ll feel better. 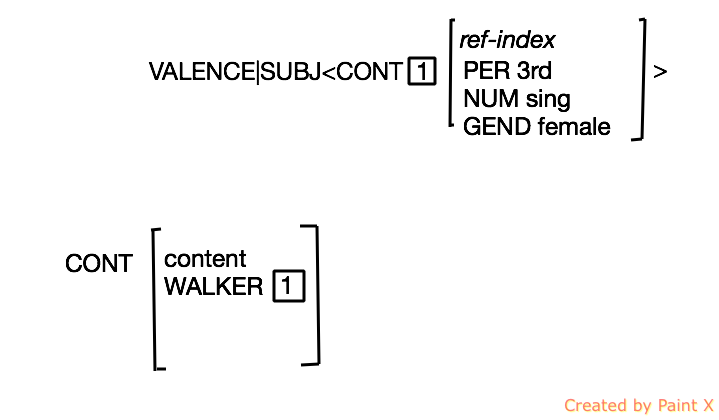 In the feature structure for walks, the first attribute to notice is PHON. This is information about the sound (phonological information) and we are going to completely ignore it. We’re not interested. Someone else can worry about it. In the AVM for walks, it just has the word written <‘walks’>. Ignore it. Unless you’re a phonologist! This PHON feature should give you a clue, though. No one really knows about any of these features, so you can have a little fun with them. The other attribute of a word is SYNSEM. This is more important to us: it is the syntactic and semantic information contained in a word. Remember that people were always complaining that Chomsky ignores semantics? Well UGs don’t ignore semantics. They try to model meaning in words, too. This isn’t easy, but give them credit for trying! You’re going to have fun thinking about this. CAT stands for CATEGORY. These are the syntactic features. They decide how the word behaves grammatically. CAT has two attributes, HEAD and VALENCE (or SUBCAT). HEAD just says what kind of word it is, a verb or a noun or a preposition or a determiner or whatever. Walks is a verb. If you say walks is a preposition, you have a problem. VALENCE/SUBCAT gives information about how the word combines with other words. Walks doesn’t need a complement. However, walks really wants to hook up with a 3rd person singular noun as its subject. Walks actually specifies information about its subject’s CATEGORY and CONTENT. 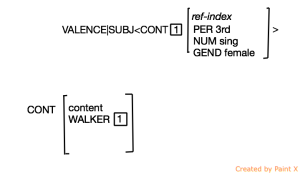 Walks is looking for a CAT|HEAD noun that has CONTENT|PER 3rd, NUM sing. CONT stands for CONTENT. You can probably guess this is the meaning of the word. In the word walks, CONT information from the subject is matched in its own CONTENT. Information from the subject’s content is merged into the verb’s own content. For example, if walks takes the noun she as subject, then the subject’s content information is matched in the verb’s content. So this will also involve the gender information. Where you see a number in a square, as above, it just means that the information is shared. It takes a little while to get used to this merging of information all over the place. However, this feature sharing and phrase structure rules is ALL THERE IS to UGs. That’s it! Understand that and you understand everything.